Magali is a System-on-Chip (SoC) for 4G communication manufactured in 65nm technology, which consists of 22 IP cores. Two IP cores were contributed by the founders of Creonic for the Magali-ASIC in cooperation with CEA-LETI, France. 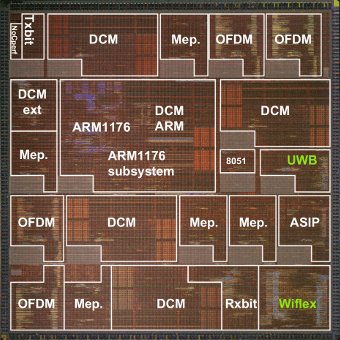 an LDPC decoder for high data rates of more than 640 Mbit/s within the context of UWB applications. 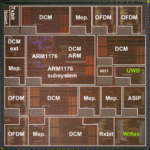 a flexible LDPC decoder (WiFlex) that supports multiple standards such as WiMax and WiFi at the same time. The LDPC decoders were successfully adapted to the interfaces of the Network-on-Chip (NoC) as specified by CEA-LETI in order to be able to communicate with the rest of the IP cores on the SoC, such as the ARM processor. Contact us for further information or read more in “A 477mW NoC-based digital baseband for MIMO 4G SDR”, ISSCC 2010.